the best so far. 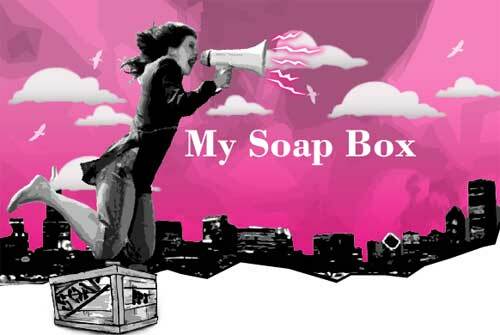 : the [edited] soap box. **My desire to not offend people came back after a night's sleep. I believe that natural birth should be looked into much, much more than it is. Women should do more research about birthing and what all goes on, and shouldn't just accept the way of epidurals, petocin, etc. just EDUCATE YOURSELVES! its disgusting that most women do more research for new phone plans, car purchases, home buying, etc than they do about having a baby. and please watch "the business of being born" on instant play on netflix, if it is available to you. even if its just to show you other options! Show more belief in yourself. Women's bodies were made to give birth. Even if you "don't like pain", the experience can be beautiful for many women, pain and all. Don't give up so easily without even considering other options. wow very intersting... i have to say my opinion of an epidural is kind of "whatever you want", seeing as how i'll never get one now. that is something i was TOTALLY willing to get with james because i HATE pain, but if i hadn't had to get a c-section, i would of thought twice with this one. i have just heard too many horror stories of the epidural not working right and also so many great stories of natural birth. i'd at least try... maybe :) but i 100% agree with you that there are way too many "emergency" c-sections that aren't that emergency or was caused by something other than the actual birth/baby. i feel super blessed that mine was due to a breach baby and i had no control over that whatsoever. i had a wonderful experience with mine (i have a strong opinion about c-sections :)), but i have come across so many women where their c's were kind of under dicey circumstances and they are bitter towards the vaginal/natural birth experience being taken away from them. i do feel that women and dr's need to take a step back with the medicine and let nature take its course more. I always think that it's funny when someone who hasn't ever experienced birth is so passionate about it. lol. You're entitled to your opinions, and I'm not saying you're wrong at all. I just think it's interesting. With my last labor, I wasn't dilating until after I had my epidural. I was so stressed out by the pain that stress reaction was keeping me from being able to progress naturally. This is actually an evolutionary thing. In a world where predators are a worry, that kind of stress can keep the baby from being born in a dangerous situation. I was at 4cm for 9 hours before I got my epidural, and he was born 5 hours later. I was headed for an emergency csection with him (he was under a LOT of stress as well), so I'm glad I did it. If I'd kept trying to "stick it out," I would probably have ended with a csection rather than a vaginal birth. But having been on the end of things where things go horribly wrong, and having had a baby die, my perspective is a little different. To me, it IS a medical condition, and one that can kill you. Sure for thousands of years women have had babies and maternal death in childbirth has been a major killer of women (let alone the babies). Do I think the csection rate in the US is ridiculously high? YES! Do I agree with you that women need to do more research on birth options? HELL YES! Do women need to make their own decisions for their own births and not be bullied by doctors? yes. But I cannot accept the "our bodies were made to do this," because people gloss over just how common real complications were before medicine got to the point it has. Oh, and I forgot to add, I don't think I was any less joyful at the births of my children because I didn't experience all the pain. After the epidurals, I was able to participate in my labors as something I was doing and in control of rather than something that was happening to me and I had no control of. With Patrick I went from crying hysterically with every contraction and being afraid of the next one, to actually enjoying and being excited by the process. I felt more empowered without the pain than with. Thank you Brittanie, I like your points of view. And I think that feeling strongly about it is just like it is with motherhood. No, I havent had a child yet, but I still can see things around me and have an opinion, ya know? I think that the main part is just that no one seems to research anything at all about pretty much the most important thing in their life, because they just accept the "normal" way of things. and I think that, just as much of modern medicine, c-sections and epidurals CAN be great. If necessary. But it seems like much more often than not, they are NOT necessary and people end up creating much more complications than what would have originally come up. I am grateful for my epidural, but more importantly I am grateful for a healthy baby and a healthy me. I think people put too much emphasis on no epidural or epidural or no c-section or c-section or a must-have mid-wife or gotta have MY OB. Honestly, in my opinion, the end goal should be healthy baby, healthy mom. Epidurals and doctors and monitors and whatever else they have to do is fine with me. I love that you just said that! I think it is so so so important to be open to everything! I couldnt agree with you more! It is all about education! You have to educate yourself and do what is best for you! Some of the most amazing experiences I have had with pts was helping them through a natural birth...i do know from experience its not for everyone...but that is what is so great about the power of medicine but I do believe that people sell themselves sort and dont believe in themselves when they really could do it! ITs all about being open to all the options! and EDUCATION!!! when I go into labor I am going to do as much as I can naturally and if I cant do it and know the epidural is waiting for me and I am so glad I know that! MEdication is a gift to this generation that I am so grateful we have!! Thanks for your opinion Tiff that is what makes my job so great...all the different ways people go through labor...it is great to be apart of! I LOVE THAT DOCUMENTARY, very interesting. I love that you love watching Netflix documentaries now. uhh cassandrew?! where is your blog!!! i miss you so much!! Great post and I agree with all the mommies above. The biggest thing is that every mom is different and every birth is different. It is hard to write up a "birth plan" and think that it will be followed perfectly. It is best to have an open mind and go with your instincts! For me, the epidural saved me in my 15 hour labor experience. I'm all about trying for a natural birth but after 4 hours of double peaking contractions, I was deaaaad. Let me know how it goes when YOU have a baby. I LOOOVE hearing birth stories!! !